Trivandrum, 14 December 2012: The Trivandrum - Chennai Duronto Express announced in the last Railway budget will start its inaugural run from 15 December 2012. The Duronto Express with full AC coaches and with no stops will take only 12 hours 45 minutes to travel from Trivandrum to Chennai. Currently it requires 18 hours in express trains. T. No.22207 Chennai Central – Thiruvananthapuram AC Duronto bi-weekly express will leave Chennai Central at 16.30 hrs. o­n Tuesdays and Fridays and arrive Thiruvananthapuram at 05.15 hrs. the next day. T. No.22208 Thiruvananthapuram - Chennai Central AC Duronto bi-weekly express will leave Thiruvananthapuram at 21.30 hrs. 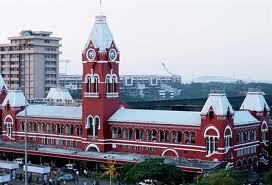 o­n Wednesdays and Saturdays and arrive Chennai Central at 10.15 hrs. the next day. The composition of the above trains will be 1 AC First Class, 3 AC 2-tier and 9 AC 3-tier coaches. Advance reservation for the above trains will commence o­n 13.12.2012.